"We have struck an iceberg and are sinking by the head." Wireless radio operators aboard the Titanic cried out to a German ship, the Frankfurt, shortly after striking an iceberg 20 minutes before midnight on Sunday, April 14, 1912. The distress signals went out for over two-and-a-half hours to any vessel near enough to rescue passengers of the fatally wounded ocean liner. No vessel was close enough (at least any vessel with its radio turned on) and when the world's largest and most "unsinkable" ship slipped beneath the surface of the frigid North Atlantic at 2:20 AM, April 15, 1912, more than 1,500 passengers perished. Number One: If you allow your career and/or reputation in the workplace to be damaged beyond repair, you're likely to "sink by the head." "That will never happen to me," you might say. But those may as well have been the words of Titanic captain Edward Smith, probably uttered at one point or another before he went down with his ship. The more important lesson in the Titanic tragedy/analogy is that the ship did not strike that big white thing out on the horizon*. The Titanic struck a spur of the iceberg that was below the waterline--invisible from the surface. (*) Okay, it was dark at 11:40 PM. But the ship still didn't hit any ice above the waterline. Science class wizards all know that an iceberg (or an ice cube in your Ginger Ale) is 1/8 above the surface and 7/8 below. Human beings at work (or anywhere else) can be similarly below-the-surface creatures. What you see is likely to be 1/8th of what you actually get. Maybe we'll call it 20 percent above the surface and 80 percent below to honor Vilfredo Federico Damaso Pareto. But the point holds. This is why so many people who lose their jobs exclaim, "I never saw that coming!" as they head for their first appointment with a career transition coach. Many, if not most, job losses occur when the employee strikes a spur of an iceberg that he or she never laid eyes on or thinks they've just barely missed. Even when layoffs are predicted, it still comes as a surprise to many that they are swept up in the sweeping RIF (or reduction of force). 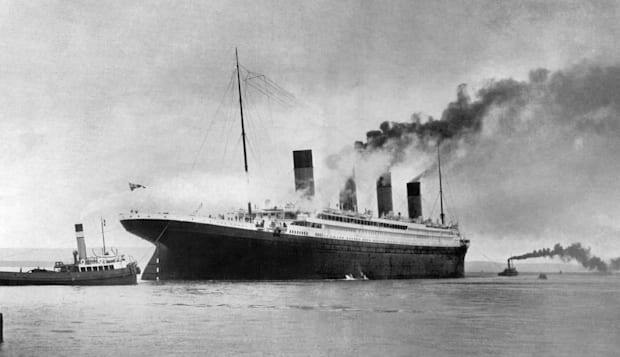 Number Two: The Titanic was warned by other vessels for more than 24 hours before the collision that there were icebergs in the area. Still she steamed ahead at full speed (AKA business as usual). Even after the collision, many passengers refused to believe (A) the voracity of the story, and/or (B) that they were actually in danger. How many employees have similar attitudes after receiving warning signals (AKA written warnings and/or counseling by the boss or HR)? Don't ignore those performance reviews--especially the "icy" ones. Ask for clarification and invest in fixing what they tell you is broken, whether you agree or not. Don't assume that it will blow over and that the warning signs mean nothing. Even if you see little at or above the surface to be concerned about, that doesn't mean there aren't sufficient problems lurking below the surface to sink your ship. On this 103rd anniversary of the Titanic's first and final floundering, pay attention to where you're headed, potential hazards in your path, and make sure you have enough life boats should you voluntarily or involuntarily abandon ship. Just because you don't see a job-threatening danger doesn't mean it's not there. If that sounds like paranoia, perhaps Captain Smith should have been a little more paranoid than he apparently was. Fortunately, if one job sinks from beneath you, you will most assuredly sail again, with eyes open wider. In fact, let's just call keeping one's eyes and ears open at work a "best practice."